When some think of Tennessee, what’s the first thing that often comes mind? That’s right, country music and SEC football. But over the past decade, a sport has gradually started competing with two things Nashville is known for. And what sport is that? You guessed it, hockey. Some people disregard the sport of hockey in the south, saying “it doesn’t make sense” or “it doesn’t belong.” But ever since I was little, I’ve watched this “small market” team grow into something incredible. The Nashville Predators became an NHL team in 1998-99, just one year before I was born. I didn’t start getting into hockey until about 2007, the year Canadian businessman Jim Balsillie was attempting to relocate the team from Nashville to Hamilton, Ontario. Just to give you a piece of what this Preds team looked like, JP Dumont led the team in goals, with Jason Arnott in assists and Chris Mason was in goal. In 2007, Pekka Rinne hadn’t even played a full game yet. This is what the team looked like when I fell in love with the sport. This team could had trouble averaging 14,000 tickets sold a game. Watching this organization grow over the years has been absolutely incredible. From Preds to college, to junior, and pee-wee hockey, the community has grown to not only accept hockey but love it. I’ve been going to games since I was in grade school and watched the fan base slowly grow, and understand the sport more and more. When I compare games then, to games now, there’s nothing to say. From almost losing the team to selling out every single home game of the 2016-17 season is something for the history books. When it comes to the fan base, the support over the years has grown immensely. Nashville went from a non-traditional hockey market to an organization people travel from all over the world to come see and experience. I can no longer easily find a parking spot downtown for games, or walk in without bumping into anyone. I now run into the arena at 5:30 when the doors open, hoping I get there early enough to get a spot along the glass to watch my team during warmups, along with over 17,000 other fans just as passionate about this team as I am. I’ve also been able to introduce hockey to many people, and have them experience games for the first time. I took one of my good friends to Game 3 of the Predators/Blues series, and they said they’ve never seen something so incredible or heard an arena so loud. Standing right beside me during the standing ovations during TV timeouts, we couldn’t even hear each other speak. 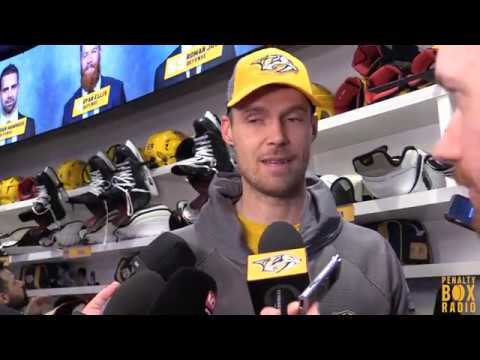 The Predators haven’t only made Tennesseans aware of NHL hockey, but college hockey as well. SEC hockey is becoming well known in the city of Nashville. Being the home of the South Eastern Collegiate Hockey Conference tournament in February, all SEC schools travel to Nashville to participate. I had the honor of working this event this past year. It was one of the best experiences of my life. I never really paid attention to college hockey until that weekend. And it was then that I realized how much I had been missing out. The support that even college teams had from fans, was so cool to see. The Georgia Ice Dawgs had about 50 traveling fans along with them through the tournament. But one team that really stuck out to me was Vanderbilt. They aren’t necessarily known for hockey, but every single player on that team played like it was the last time they ever would. It was so fun for me to watch a team play and fight as hard as they did. And although they didn’t win the tournament, they sure made an impression. Seeing the young talent that college teams possess, and trying to capture important moments on video was the most fun I’ve ever had’ along with interviewing the players, and really see what motivates them to work hard and do what they love. Participating in that event made me realize that I wanted to pursue sports journalism and broadcasting professionally, and I couldn’t be more thankful for that. Nashville is no longer just a football-loving state. It is a place filled with passionate fans, that fill up arenas and drive hours just to support their respective teams. It is a place where you don’t just fall in love with a sport, you fall in love with the city. And on October 10th, the Nashville Predators will raise their very first banner, representing the 2017 Western Conference Champions, something that this loyal Preds fan, along with tens of thousands of others have waited for since that day in 1998-99. I couldn’t be more proud to call myself a fan of this team, and I plan to keep it that way for the rest of my life.